Everyone loves a beautiful princess who starts with humble beginnings. Cleaning out fireplaces, sweeping the kitchen, and making dinner. No wonder your stepmother is so afraid of loosing you! But if you really want to make an entrance at the ball (without having one of those fancy long titles) and get the prince's attention, then you'll need to spice it up a bit. Let your sweetness shine through in this sparkling Blue Sequin Princess Costume. Find your Prince Charming before midnight in this elegant Child Shimmer Cinderella Costume from Disney! To complete your shimmer Cinderella costume add our Cinderella wand, tiara and clear shoes. Then get into your pumpkin carriage and you're off to the ball! Bring your favorite Disney movie to life with this Child Shimmer Tiana Costume! It includes dress, petticoat and headband. She'll be ready to kiss a frog this Halloween! This Deluxe Toddler Cinderella Costume will turn your little girl into a fairytale princess. Just add tights and glittery silver or clear shoes, and she's ready for the ball! Dancing all night can be a lot of work, so you better wear something comfortable. This skater dress will fit the bill! You might just meet a beast of your own, but if he happens to be a regular guy, that's okay too! Dance around like a princess. 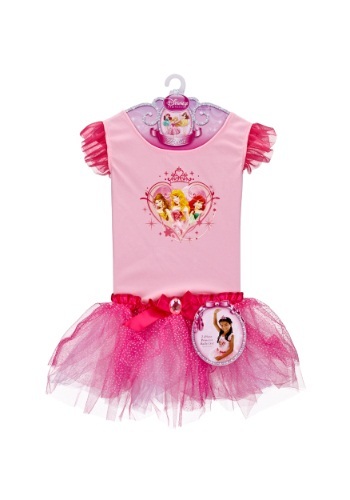 Your little one will love wearing this Disney Princess Ballet Dress. Belle, Ariel, and Aurora are all on the front. This dress is actually two pieces so you can wear the leotard and tutu separately! Princesses have a lot of important duties to perform! They can't just sit on the throne and look pretty all day, since they need to light up the party. (It's in the Disney Princess code book somewhere). One of the best ways to make sure the party has the bright and lively look is with this Princess Glow Wand. Not only does it glow, but it has Cinderella, Belle and Rapunzel on it, so you can get a little help from your favorite princesses. Prince Charming will definitely be enchanted when your daughter wears this Girls Cinderella Sparkle Classic Costume to her Halloween party! Add a Cinderella wig, tiara and wand, and a pair of glittery blue ballet flat shoes or "glass" slippers, and she's ready for the ball. Just make sure she's home by midnight! No need call upon a fairy godmother to give your daughter the perfect princess look this year. All you'll need is this great Cinderella costume and she'll feel ready for any ball. This is a great costume for your little Disney fan to pretend to be her favorite princess in. Become a Japanese princess in this Girls Mulan Sparkle Classic Costume! When not off fighting bravely for her people, this sweet little royal knows how to dress for a ball. Don't let her sweet dress fool you though, she's still one tough lady! This Halloween let your little one's wish come true to become a princess with this Cinderella costume. She won't need the help of a fairy godmother to look fabulous when she has the adorable onesie on. This is a great costume for a whole family of Disney themed costume. Be your child's own Flora, Fauna, and Merryweather all in one when you grant her wish and deliver this Toddler Sofia the First Deluxe Costume! Once she has the right look, she can attend Royal Prep and learn all the ways of the princess, especially how a princess's actions are the most important thing.